I was very sad thinking I would have to miss this month's B.O.M.B challenge since the theme is Flowers. Kidlet likes flowers, but there is a kid in his class who has been tormenting him by calling him girly. We were playing Super Mario Brothers the other day and when I saw these fire and ice flowers and knew they would be perfect! Kidlet said yes they were very manly flowers lol. Fire Flower is cheese and food coloring marker and sits on top of a peanut butter sandwich. On the side are strawberries, carrots, and blackberries. Along with my new blog look, I have a button you can grab! This was made by another one of the super talented artists we have over at BearvilleGuide, katiesweet10! Littler Egg recognized your Mario theme right off! She said, "She's a very good bentoist!" 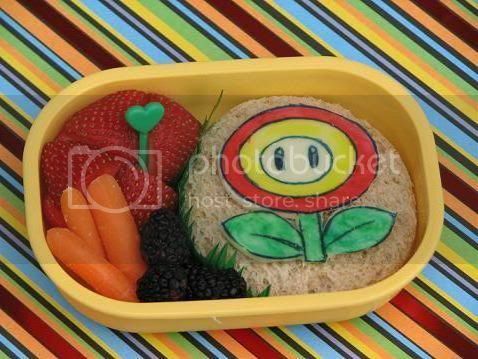 Way to find a way to put a manly flower in the bento for kidlet! Hey, this is a very good idea for manly flower! My elder boy is very particular about that too, he will complain if I put some too girlish thing in his bento. I shall try something like this. Thanks for the idea! It's good that your boy is so open with you and that you listened! I like the manly flower! Why are kids so mean?! You make awesome lunches. I love seeing how creative you get with such simple ingredients! Absolutely....the Mario Flower is quite manly! When my son was in KINDERGARTEN, he picked out a Winnie the Pooh book at the library and some of the kids called him a "baby." Well, hello...they were FIVE! Kids!